While Jebu Donga may not be the most deep and meaningful film of 1987 (or indeed any other year), it does have a slightly different approach to the Mass Hero as well as sufficient quantity and variety of dances and explosions to keep me amused. Chiranjeevi is Chitti the pickpocket, happily fleecing the rich, helping some of the deserving poor and indulging his love of disguises. Bhanupriya is his rival in petty thieving, and has an equally strong commitment to the dress-ups and convoluted schemes. Satyanarayana Kaikala and Maruthirao Gollapudi are the not as bumbling as they seem CBI officers who need to get a spy into Raghuvaran’s gang. And Radha is a woman of mystery. The police decide to use the unwitting Chiru as a distraction, feeding the crooks a fake top secret file that names him as Special Agent Chakrapani. While he goes about his daily crimes, the crooks are after him and the cops are watching the shenanigans. But eventually things come to a proper masala conclusion, albeit one with a couple of surprises. While Telugu mass films are all about the hero, one of the things I enjoy most about Jebu Donga is that Chiru’s character is not as much in control as he thinks he is. He reacts to the confusing succession of attacks and rescues but has no idea why some things are happening. He tries to beat Bhanupriya’s character to a heist but ends up losing his trousers – don’t panic, it is all quite family friendly. Radha appears as a woman from Chakrapani’s past and Chitti is unable to say no to her. And the police manipulate him so easily. He does have to do his bit to save everyone at the end of the film, but he is not the usual know-it-all lone hero. 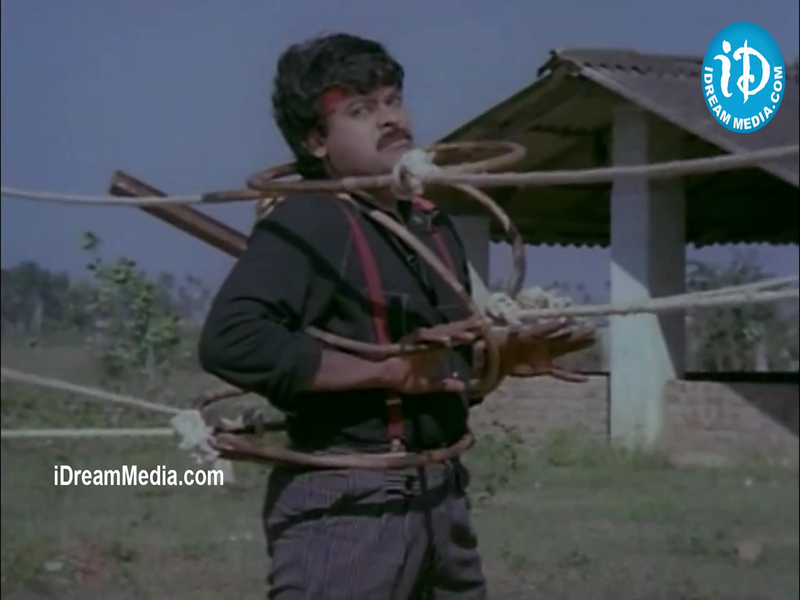 Chiranjeevi makes the most of his role, adding a dash of levity to the fight scenes as well as flirting up a storm. I looked over my notes from watching the film and at one point I have just written “Jeep! Whips! Leaping!” Chitti is a good person apart from being a thief, and he helps out where he can. One of his robberies even helped a reluctant bride escape an unwanted marriage. He has what might be a sister and younger brother (Shanmukha Srinivas) as well as his mother to provide for, and pretends to them that he is a labourer doing honest work. The songs are a real highlight, and not always just for the outfits. 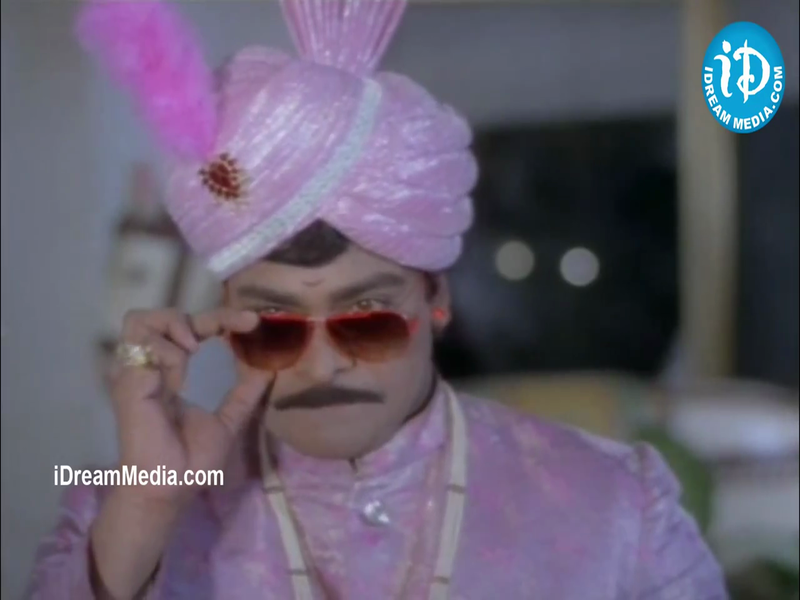 I love Rajaloo Rajalakshmi where Chiru steals Bhanupriya’s clothes while she is bathing. His dancing is uninhibited and cheeky (even including a bit of snake style), and once she finds something to wear she dishes it up in equal measure. I’m not so sure about his wardrobe choices. The double denim and highpants are a symptom of the late 80s but I really do not get the sleeveless skivvy. Bhanupriya’s character is a bit ditzy although she exhibits competence in her chosen field of cons and theft. While Chiru is relatively plainly dressed, she wears some outrageous outfits and more than holds her own in the dances. I’m not sure how she is related to Chitti but when she falls for him it feels more as though they have been meant for each other for a while but are only now admitting there is an attraction. And where many a filmi heroine has to be rescued, she does her share of saving him too. She knows she is smart and sees no reason to let the slightly dim but charming Chitti overrule her. Radha’s character is the real secret agent. I think she tells Chitti that he is a perfect lookalike for the deceased Chakrapani and he cannot resist her helpless female act. He should have been alerted when her dream sequence song turned up looking like this! She is smart, runs her own operation although her dad is one of the CBI officers using Chiru, and she has firm views on what needs to be done. Like Bhanupriya, she will accept help but she doesn’t always wait around for it to materialise. All good heroes need a bad villain. 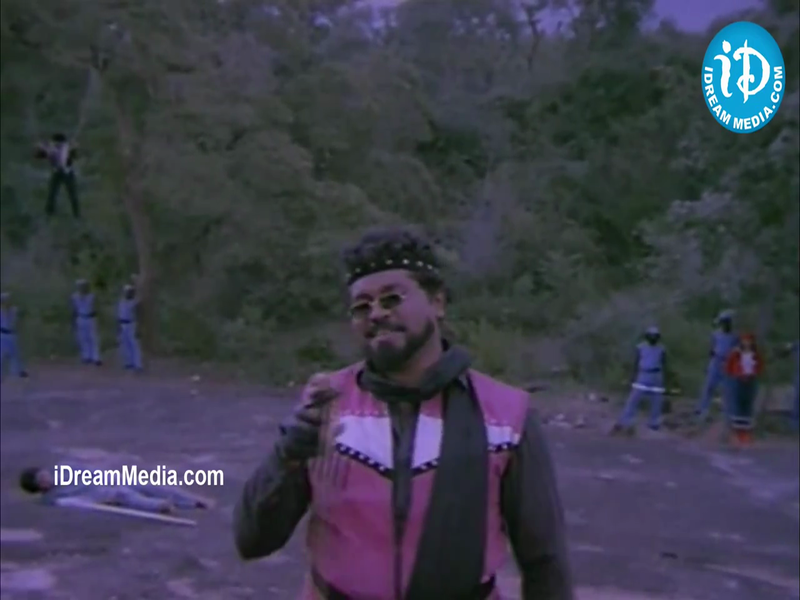 Raghuavaran is the sleazy Peter, the main man who runs operations for the completely insane Kannada Prabhakar. I always like a bit of megalomaniacal set design and sadly that is where Jebu Donga fails me. Peter lives in a respectably glossy mansion decorated with portraits of himself and masses of horrible modern sculptures while the bad guy HQ is a simple rustic camp. Not quite up to the Mogambo gold standard despite the impressive commitment to training shown by the minions. Most of the thugs wear that pale blue or mauve, but there are special colour coded sets as well as some plain clothes goons. Satyanarayana and Gollapudi are actually lots of fun as the police masterminds. They amble around, two portly middle aged gents who giggle like school girls as they watch the drama ebb and flow around their hapless helper. They also have some odd little flashbacks to what I think are Gollapudi’s terrible ideas for going undercover. Chakravarthy’s soundtrack borrows from Mr India, Michael Jackson and who knows what else. It’s all great fun, largely due to the enthusiasm of Chiranjeevi and Bhanupriya. 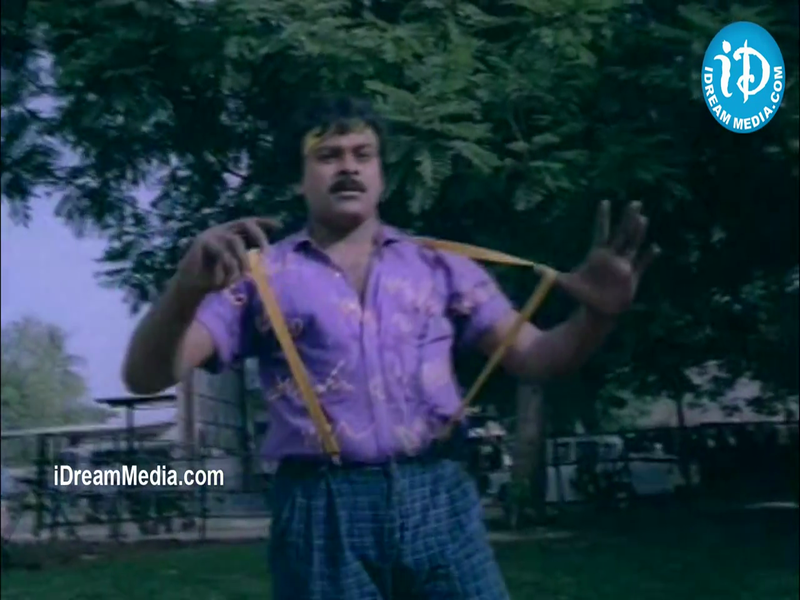 And for once, the ladies get the sequins and lycra while Chiru dresses relatively conservatively. 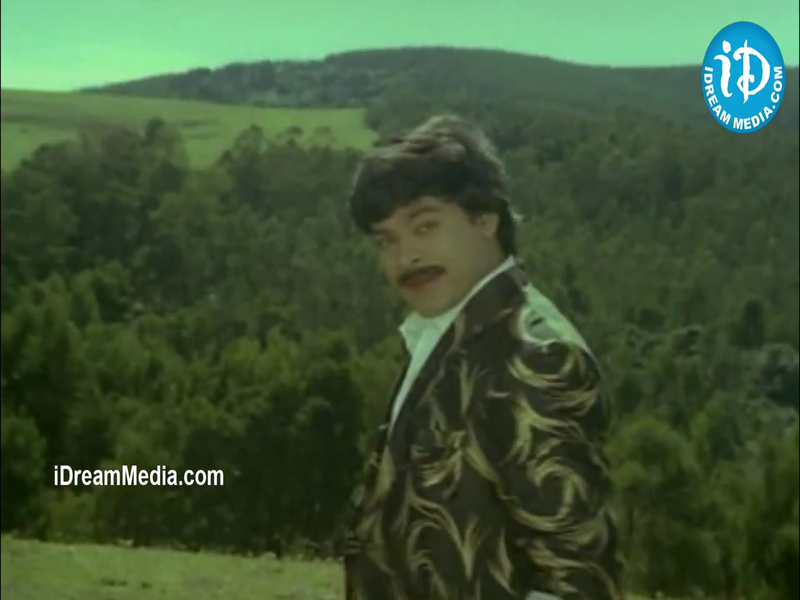 I always have reasonable expectations of a Chiranjeevi/A Kodandarami Reddy film. There will be heroics, fights, dances, romance, eyeball melting colour and movement and almost no traces of logic. Jebu Donga delivers and shows Chiru in a more comedic, blundering hero role. Chitti may be a bit thick but Chiru knows exactly what he is doing and how to wring maximum entertainment from his material. The movie is available on YouTube. If you’re wondering, I deliberately chose the upload with the most offensive watermarks. Dear Reader, if you know anyone at that poxy company, please gently slap some sense, or at least some shame at defacing a film, into them. Well worth seeing for the excellent cast and the frothy material. 3 ½ stars! I will leave you with a Megabirthday Masala Multiple Choice Quiz. Please examine the following image. Which of the following happens next? What do you mean which of the following? That’s a rookie question. All of the above, of course! This entry was posted in Tollywood and tagged A. Kodandarami Reddy, Adventures without subtitles, Bhanupriya, Chakravarthy, Chiranjeevi, Chiru, Gollapudi, Happy Birthday Chiranjeevi, Kaikala Satyanarayana, Kannada Prabhakar, Megabirthday 2014, Radha, Raghuvaran, Telugu. Bookmark the permalink.